Global equity markets maintained recent momentum and continued their slow and steady climb during the 3rd Quarter of 2017. Considering the backdrop of political unrest, lack of tax or healthcare reform and a litany of disasters, natural and otherwise, the markets around the world have been surprisingly strong. International Markets paced the rally, as Developed Markets and Emerging Markets rose 8.0% and 5.5%, respectively, in the quarter. The S&P 500 put up a respectable 4.5% gain, contributing to the 14.2% rally since the beginning of the year. The market seems to be looking past the risks and instead focusing on decent GDP growth (3.1% in the latest quarter), low interest rates (2.3% on 10-year government bonds), and the virtuous cycle of the wealth effect from a record high stock market to keep the music going. There is considerable hand wringing in the market about the valuation of the US market compared to historical averages. The chart below shows the forward PE over time and statistical measurements. On a number of metrics, valuations are higher than historical averages and some analysts are cautioning investors. In a recent note JP Morgan agrees that valuations seem on the high side from a Price to Earnings (PE) perspective. They estimate that the US market is about 9% overvalued and they “would not be surprised by a 10% pullback”. A pullback may come, as there are regularly 5-10% declines in the market, and we are overdue for one. However, simply looking at PEs is not a best way to value the market. Investors need the context of other considerations. Some suggest is more accurate to compare them to the long-term yields for Treasuries, or high-quality corporate debt. That way stock valuations are compared to other investment options. One method of doing this is used by the Federal Reserve Board. 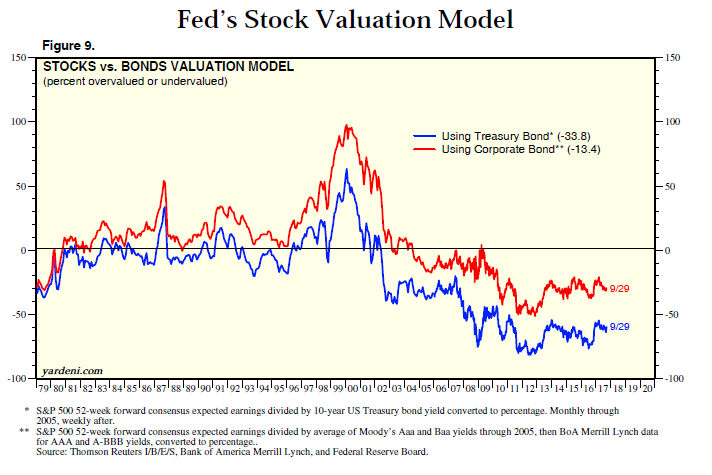 The “Fed Model” compares the earning yield of the market (calculated by the inverse of PE) to the yield to the returns offered by the competing interest rates, namely corporate bonds and Treasuries. Inherently, bonds are safer and should offer lower rates, but offsetting that, the earnings of the market should grow over time. It is the market’s job to weigh the relative riskiness versus the growth. The chart above shows the relative valuation of the earning’s yield of the market to the yield of high-quality debt. The idea is: the wider the gap the red and blue lines are below zero, the more undervalued stocks are. The chart goes back to the late seventies. From 1979 until the mid-90’s, the colored lines had fluctuated around the x-axis. Then, during the tech boom of the late-90s it showed the market was over-valued. After the tech crash through the Financial Crisis, again the market was anchored to the zero line. Since the Financial Crisis, stocks have traded for a consistent discount while the Fed pushed interest rates down to historic levels. Even the stock market rally of the last 20 months has done little to bring stocks back to the “fully valued” level. It is doubtful one could simply trade this gap and beat the market, but it does make sense to view the market at about 17 times next year’s earnings (or an earning’s yield of 5.9%) cheap compared to 2.3% Treasuries or 3.5% corporates. The two main risks to this theory are: weaker than expected earnings and higher interest rates. Focusing on the prospect of higher interest rates, the odds of higher rates seem to be increasing. The Fed had been aggressively buying long term bonds after the financial crisis keeping a lid on interest rates which helped stimulate the economic recovery. Recently though, the Federal Reserve began detailing the how they will eventually unwind their bond purchases. With the Fed now selling longer term bonds, the risk of higher rates loom. Keeping an eye on these yields should be key to judging the direction of the market. Staying committed to your investment plan can be difficult with the litany of risks facing investors today, but stick to investing in equities in-line with your risk tolerance. Include foreign markets and smaller stocks as their recent out-performance is encouraging, as they catch up to the performance of the S&P 500. On the fixed income side, a core portfolio of high-quality corporate and municipal bonds should act as a buffer if there is some market turbulence. Also consider add some higher yielding bank loans and bank-issued preferred stocks which still seem to have decent risk/reward characteristics especially in a rising rate environment. One area to highlight are preferred stocks. These are generally issued by banks and they have many attributes that make them attractive in the current environment. A representative mutual fund has a 5.25% yield – higher than similarly rated bonds with the same duration. Not all preferreds are equal. They can vary in how the dividend rate is set and whether they are sold through retail channels or directly to institutions. Some funds focus on ones with annual resets of the yield, so as rates rise, so does the yield, mitigating the risk of higher interest rates. Also, they favor ones sold directly to institutions, which is a deeper pool, and one not affected by retail investors, or the ETFs they trade. Importantly, preferreds are a form of stock, so that the distributions are considered dividends and eligible for the Qualified Dividend tax rate, so are taxed at lower rates than interest payments. It’s the scary word that we try to avoid, manage and eliminate from our lives. The stock market is risky, no doubt. There are crashes and entire decades where the returns are essentially zero; however, to- date, the long-term direction has been up and to the right, steadily increasing in value over time. It has been a remarkable way to compound your assets. That is the entire stock market-- a diversified portfolio of companies. Beneath the surface, there are segments with fantastic returns, and those where whole industries that have vanished. Financial history is riddled with stories of blue chip companies like photography giants Kodak and Polaroid, or internet companies like Netscape and AOL more recently, who’s products and services haven’t stood the test of time. Concentrated portfolios can lead to substantially more risk. Existential risks to sectors will only increase as the world becomes more digital and technology-driven. There is one such threat which may acutely harm Houstonians- the health of the energy sector. Many Houstonians already have a lot of their wealth tied to the price of crude and crude products. Their jobs, company stock options and home values are inextricably linked in the health of these markets. Much of this cannot be helped (your job is in Houston and you must live somewhere), but a behavioral bias that affects many is a sense of control by investing in a market that they know. For Houstonian that is the energy sector. This concentration is unwise, especially since there is a chance there are catastrophic risks due to three major factors. Proliferation of self-driving cars—Billions of dollars are being spent to figure out how to make self-driving cars a reality. If this becomes the norm, due to the cost structure of battery-powered cars and relative ease of computers driving electric cars, the fuel powering transportation will shift even further from oil to electric. Falling cost of production-- As the marginal costs drop, it becomes easier and cheaper to find oil and gas, exasperating the oversupply problem. The increase in electricity usage at the expense of gasoline, combined with the lower marginal cost of exploring and producing crude may significantly change the crude and refining markets permanently. Blue chip companies with billions of dollars of hard assets could be severely affected if the need to refine crude or transport gasoline around the country is cut. If crude prices were to drop into the $20s per barrel, exploration and Production assets with higher production cost may be white elephants. While this scenario may seem far-fetched, it is certainly a possibility, and must be considered when looking at your overall risk. Working with a financial advisor can help ensure you are thinking through these and other issues, to ensure you don’t have a “crude” awakening. Do Traders Need A Financial Advisor?